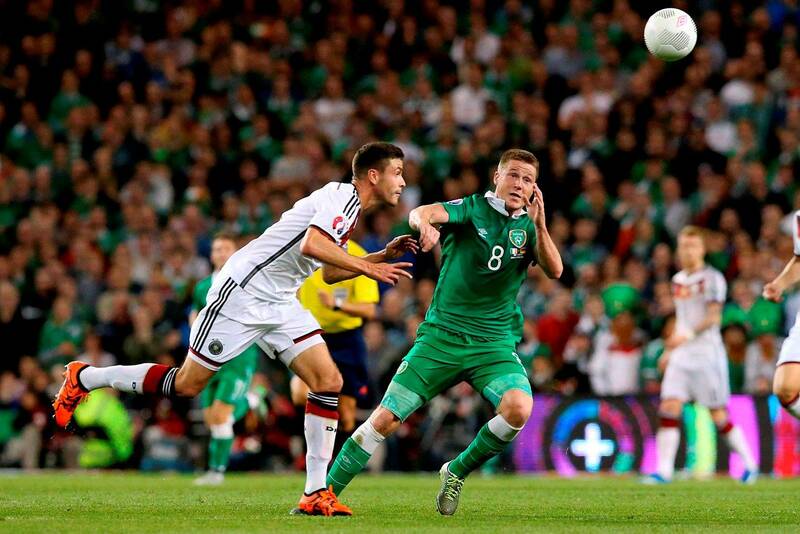 An historic night for Ireland as the world champions Germany are toppled thanks to a Shane Long thunderbolt. On an unseasonably still October night the Aviva stadium finally shook with the intensity of its predecessor thanks to an Irish victory that was the stuff of dreams. That is was achieved through a combination of passion, valour and no little skill against the champions of the world makes it all the more remarkable. The stats don’t lie in relation to Ireland’s inability to beat teams ranked higher than them but, 14 years after Jason McAteer goal sunk the Dutch we finally have an occasion that not only matches that but in many ways surpasses it. 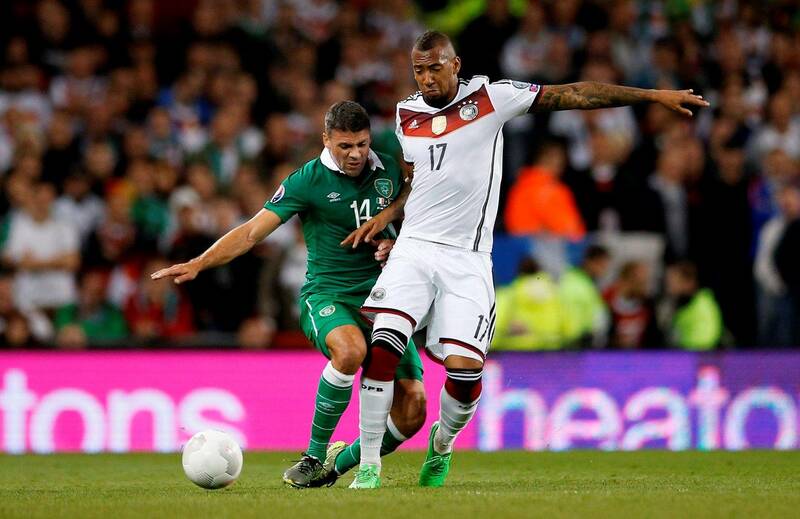 That it came against Germany at a time when the Irish were missing several key players like Seamus Coleman, Glenn Whelan and Ciaran Clark makes it all the more wondrous. As ever Martin O’Neill’s team selection raised several eyebrows before kick-off with Daryl Murphy in for an expectant Shane Long and Stephen Ward starting at right back after scarcely playing a minute of football this season. But at this juncture it would be unfair to criticise O’Neill because out of seemingly nowhere he came up with a tactical plan that worked in almost every respect. That’s not to say that Germany didn’t hold sway because as expected they owned the possession stats. Their early dominance was ominous as they clocked up half a dozen corners within the first quarter of an hour. The corner count was only matched by an outrageous number of diagonal balls with the receiving German wingers finding themselves in acres of room on each occasion. It defied logic that Ireland would allow this opposition so much room but for some reason it rarely impinged on the home side’s ability to get the upper hand defensively. But German chances did arrive with a free header for Boateng that went over the bar, a Gundogan shot that pinged off O’Shea and out of harm’s way and a cross that was cut out by a sliding Richard Keogh that just crept by the Irish post. It was what we had expected but the luck and application that we so badly craved was thankfully also in attendance. Germany finally did have the ball in the Irish net on 19 minutes but thankfully Ozil was ruled offside. We could breathe again. Ozil again came close with 5 minutes to half-time but his poor shot dribbled past Given’s post. Given was substituted soon afterwards after jarring his knee but in Darren Randolph Ireland have an able understudy and his calming presence and fine shot stops helped the Irish cause no end. The second half continued as it had left off, with an early chance for Schurrle the pick of the German attacks when his unchallenged volley somehow missed the target. As the half matured the belief in the Irish team and in the stands began to grow and though an unlikely draw would usually be greeted with euphoria the news that Scotland had taken the lead against Poland in Glasgow meant that realistically a win was what was required. Thankfully Shane Long’s appearance as substitute meant that the miracle was possible. His goal on 70 was a thing of beauty, albeit borne out of that Irish tradition of route one football with Darren Randolph’s punt from the back splitting the German defence and perfectly into the path of the Tipperary man’s galloping strides. Long’s control of the ball was initially suspect as it bobbled between his knees but his finish from just inside the box was powerful and accurate and left the world’s best keeper in Manuel Neuer with little chance. The eruption of noise that greeted Long’s moment of inspiration recalled the heady days of the old Lansdowne Road stadium and it marked the moment that the Aviva had truly come of age. With just over 20 minutes left on the clock the closing stage of the game made for deeply unsettling viewing from an Irish point of view. The most alarming passage of play culminated in a glaring miss from Thomas Muller from 12 yards while completely unmarked. And this from the top marksman at the last two World cups, thankfully it was nerves rather than our onion sack that were frayed. On a night of magical moments one of the best was reserved for the final passages as Jon Walters, far and away Ireland’s most consistent performer this whole campaign, somehow conspired to nutmeg one of the 4 Germans that had penned him at the corner flag to win a throw in. It was just that sort of match, it was just that sort of night and it is one that will burn inside every one of us for many years. The Irish team and substitutes were heroes to a man but special praise must be bestowed on the ever mercurial Wes Hoolahan, the heart of a lion Jon Walters, the steady as a rock leader John O’Shea, the assured Darron Randolph, the powerful and glorious Shane Long and the genuine coming of age of James McCarthy who appeared to cover every blade of grass and was undaunted even after taking a direct shot to the face late in the second period. Martin O’Neill must also be applauded for happening upon a plan that that gave Ireland real shape and purpose. 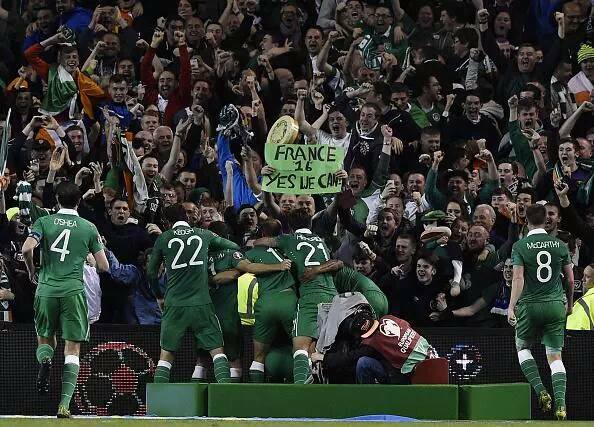 For the very first time in this campaign every Irish player on the pitch knew exactly what he needed to do. That they also did it well is down to the players but seeing a player like James McCarthy play with a freedom and energy last night can only be down to him knowing his job. This was a historic win for the Boys in Green for all sorts of reasons; most notably because it marked the first occasion in which Ireland have beaten Germany in a competitive fixture. It also means that we can move on from 2001 and that win against the Dutch. And this was no ugly win, it was a triumph of spirit over superior technical ability, passion over a somewhat laissez fair approach and most of all the belief that a team working together as one can achieve anything. They truly believed and in the process achieved something which seemed impossible. Republic of Ireland: Shay Given (Darren Randolph 44 mins), Cyrus Christie, John O’Shea, Richard Keogh, Stephen Ward (David Meyler 69 mins), Jeff Hendrick, James McCarthy, Robbie Brady, Wes Hoolahan, Jonathan Walters, Daryl Murphy (Shane Long 65 mins). Germany: Manuel Neuer, Matthias Ginter (Karim Bellarabi 77 mins), Jerome Boateng, Mats Hummels, Jonas Hector, Ilkay Gundogan (Kevin Volland, 85 mins), Toni Kroos, Marco Reus, Mesut Ozil, Thomas Muller, Mario Goetze (Andre Schurrle, 35 mins).